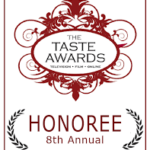 The Healthy Voyager Travel Show is honored at the Taste Awards! This year, HealthyVoyagerTV was inducted into the Taste Awards Hall of Fame. Among many notable nominees and winners, Carolyn is extremely proud of the honor and the recognition for all of her hard work on her travel and cooking shows.